The Crested Butte Wolfpack continues to ebb and flow through the season, proving their ilk in one game only to fall flat in the next. The past week, they showed that despite their tough times they could still pull together when the occasion presents itself. The Wolfpack opened the past week of games on Wednesday, January 28 against the Gunnison Blades B team. Nicholas Mikeska was called in to play goalie in an effort to hone his skills in preparation for next season. Mikeska delivered, turning 19 of 20 shots away. Meanwhile, Max Molitor joined the scoring duo of Robbie Holleran and Sam Evans on offense. Molitor netted the first two goals of the game for the Wolfpack, giving Crested Butte a 2-1 lead heading into the third. From there it was the Holleran and Evans show, as the two players scored two goals each in the third period, leading the Wolfpack to a 6-1 win. But trouble was brewing on the horizon for the Wolfpack as the same illness that crushed the basketball teams plagued the hockey team prior to a double-header home stand against the Durango Steamers on Saturday, January 31 at Big Mine Ice Arena. 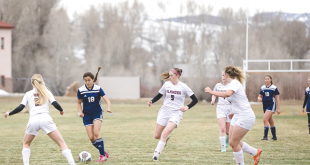 Durango came into Crested Butte in second place in the league with a record of 12-1-1 to face the seventh-place Wolfpack squad, whose record stood at 6-8. Despite the mismatch on paper, the games were anything but one-sided as the Wolfpack put together two solid efforts against the heavily favored Steamers squad. In an effort to match lines with the solid Steamers team, Bramwell moved defenseman Connor McGuire on offense leaving Ben Frame, Taylor Reeves and Kyle Hecker to share double shifts. The move proved fortuitous as McGuire ended up scoring three goals over the course of two games. Durango took a 1-0 lead in the first period of the first game but the Wolfpack responded two minutes later when Jena D’Aquila fed McGuire for a goal. Durango took the lead again at the end of the first, but McGuire finished on a Jacob Grogg assist in the second period to tie the game 2-2. 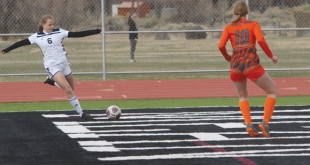 Durango netted the next two goals to close with the 4-2 win, but Bramwell liked what he saw and the team came into the second meeting of the day with renewed confidence. The Wolfpack threw everything out there in the second game, out-hustling the Steamers and linking together passes for some of the best breakouts they’ve had all year. The work produced a couple of opportunities early for the Wolfpack, but the Durango goalie was solid in net. Meanwhile, Wolfpack goalie Zach Van Dyke played out of his head in front of the Crested Butte net. Van Dyke was shelled but continued to turn away shots by Durango to hold the game in a scoreless tie at the end of the first period. The Wolfpack broke through 10 minutes into the second period when Sam Evans carried the puck past two Durango defenders to break through to goal from the wing. Evans eventually got crushed for his efforts in the slot but it paid off as McGuire followed in to push the puck through for a 1-0 Wolfpack lead. Durango continued to pepper the Crested Butte net but Van Dyke and the Pack defense were determined to deny the back of the net. At one point, after a flurry of saves by Van Dyke the puck squirted to the weak side for an onrushing Steamer wing to bury in the open goal. He fired, but Frame dove in front of the blast taking the shot off his body for the defense to clear out. The Steamers coach instructed his players to keep firing and they finally found a seam into the Pack goal to take a 2-1 lead in the third period. Durango was set up for the win with one minute left to play as a flurry of penalties resulted in a four on three advantage for the Steamers. Durango looked to kill the clock passing the puck back and forth behind their own net, until Holleran decided enough was enough. Holleran challenged the two defensemen and they pushed the puck up ice for a breakaway by their leading scorer. Van Dyke denied the open run at the net and the puck was sent back down into Durango’s zone. While the Steamers let up thinking the game was over, Holleran chased after the loose puck, catching the entire Durango team off guard. Holleran carried the puck to net, played it off the goalie’s pads to himself and stuffed the back hand in the last second for the buzzer-beater, game-tying goal. The Wolfpack has three more regular season games, all in the Gunnison Valley. They will head down to Gunnison to play the Blades “A” team on Friday, February 6 at 7:45 p.m. and then return to Big Mine Ice Arena to host Steamboat Springs on Sunday, February 8 at 7:30 and 10 a.m.